Some radio stations operate from their own buildings. Others, because of financial reasons or geographic considerations, broadcast from skyscrapers, strip malls or other locations. When companies own several radio stations in one city or area, they usually consolidate them into one building. Internet radio stations do not require the overhead of a terrestrial radio station and can be run minimally in a room — or the corner of a room, as in the case of a hobbyist. A radio tower with microwave relay dishes. Many radio stations do not house their transmitter and broadcast tower on the same property as the studios. The signal is sent by microwave to a similar microwave receptor on the grounds where the transmitter and tower reside. The microwave communication is then converted into a signal that is broadcast to the general public. It is not uncommon for a radio station's studios to be located 10, 15 even 30 miles away from the actual transmitter and tower. A single tower broadcasts for one or more radio stations simultaneously. Satellite dishes outside a radio station. Many radio stations — especially those that air syndicated radio shows — receive these programs from a satellite feed. The signal is fed into the radio station's control room where it travels through a console, also known as a board, and is then sent to the transmitter. Radio studio console, computers, and microphone. Today's typical broadcast studio at a radio station consists of a console, microphones, computers and occasionally some older analog-based equipment. Although almost all radio stations have switched over to completely digital operations (at least in the U.S.), if you look hard enough you will find some old reel-to-reel tape recorders/players sitting around. It's unlikely any actually use turntables or vinyl records anymore, although there has been an audiophile-driven resurgence in vinyl LPs for consumers. All the sound sources are mixed at the audio console before being sent to the transmitter. Each slider, sometimes known as a pot on older boards, controls the volume of one sound source: microphone, CD player, digital recorder, network feed, etc. Each slider channel includes an on/off switch and various other switches that divert to more than one destination. A VU meter shows the operator the level of sound output. The audio console converts analog audio (voice inputs from a microphone) and phone calls to a digital output. It also allows for the mixing of digital audio from CDs, computers and other sources with the analog audio. In the case of Internet radio, the audio output transfers to a server that distributes the audio — or streams it — to listeners. A Professional Microphone with a Wind Screen. Most radio stations have an assortment of microphones. Some microphones are designed for voice and on-air work. Often, these microphones will sport a windscreen. 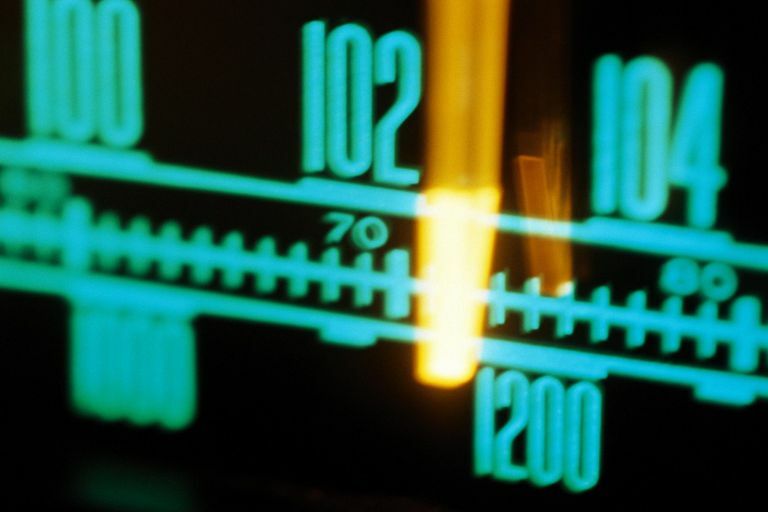 Most radio stations employ sophisticated software to either automatically run the station when a human can't be there or to help in assisting a live DJ or personality in running the station. Various types of software support station operations; the display outputs directly in front of the audio console, where it can clearly be seen by the person on-air. A pair of professional headphones. Radio personalities wear headphones to avoid feedback. When a microphone is turned on in a radio studio, the monitors (speakers) automatically mute. When the monitors are muted because somebody turns on the microphone, the only way to monitor the broadcast is by using headphones to hear what's going on. Soundproof walls in a radio studio. To keep the sound of the radio personality's voice sounding as good as possible, it's important to soundproof a radio studio. Soundproofing takes the "hollow sound" out of a room. Do you know what it sounds like in your shower when you speak or sing? That effect is the sound waves bouncing off of smooth surfaces, like porcelain or tile. Soundproofing is designed to absorb the bounce of the voice's sound wave when it hits the walls. Soundproofing flattens the sound wave. It does this by creating a special texture on the radio-studio walls. Cloth and other fixtures on the wall are usually employed to flatten the sound.